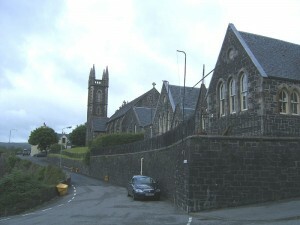 An Tobar is Mull’s Arts Centre in the refurbished Victorian primary school overlooking Tobermory bay. Opened in 1997 An Tobar is a focus for arts activities on the island. A dedicated gallery (the only one in Argyll), a 50 seater performance space, cafe, shop and workshop area are all facilities of An Tobar. The Gallery hosts a different exhibition every month, featuring both local artists and touring shows. Open for much of the year An Tobar is a visitor centre that charges no entrance fee. The events feature a broad range of music, focusing on the very best of Scottish artists. An Tobar also organises tuition in traditional instruments including pipes, fiddles, and accordion, and is involved in work with young people in the area, staging musicals, rehearsing and performing rock bands, and recording their music. Throughout the winter music and art classes are run. With a terrace overlooking the splendour of Tobermory bay in Summer, and a roaring real fire in Winter months, An Tobar cafe is always worth a visit. They serve a selection of teas and coffees, alongside the best of traditional local baking. During the summer season, they also serve light lunches including soup and sandwiches. You are also free to browse in the shop and gallery. An Tobar normally has an ‘artist in residence’ doing art workshops with children.